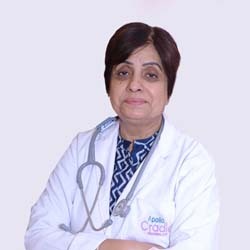 Dr. Neera Kirpal is a Gynecologist & Obstetrician in Amritsar and has an experience of 38 years in this field. Dr. Neera Kirpal practices as Senior Consultant at Apollo Cradle at Court Road, Amritsar. She also has special interest in infertility procedures and has attended and has been invited as faculty in various national and international conferences in this subject. She is a member of Federation of Obstetrics and Gynaecological Societies of India (FOGSI), and Indian Medical Association (IMA). She completed MBBS from Dayanand Medical College, Ludhiana in 1975 and DGO from Government Medical College, Amritsar in 1979. She is past District Chairman of I.W. Distt. 307 and member of I.W. Club, Amritsar. I was under the observation of Dr. Neera. She is a kind hearted person with all the perfect qualities. She never neglects her patients. One of the best doctor I have ever met. Thanks to Apollo Cradle for all the services. Dr. Neera Kirpal at Apollo Cradle had safely delivered my baby. I can say this as the best place with all the high end requirements. I recommend everyone who are looking for a hygienic and safe delivery to approach Apollo Cradle. Thanks! The best place for joyful birthing experience is Apollo Cradle. I loved the welcoming place and pleasant decorations. My doctor was Neera Kirpal who gave the best care. My family and I are very thankful to all the team for giving us the best experience. I am very thankful to Dr. Neera for making me experience the safe delivery. I and my baby are healthy and happy due to the extended care and support of Apollo Cradle team. The housekeeping staff and nurses were very much available all the times. I and my family are always grateful to Apollo Cradle for high class care. I was under the care of Dr. Neera Kirpal. Her attitude towards caring patients is supreme. Special thanks to housekeeping staff for keeping the room clean and neat. The nurses were very friendly I recommend this place as the best. as the best place to make you feel the essence of your journey during your pregnancy. I would have been completely overwhelmed without the support of Apollo Cradle where I had my delivery under the care of Dr Neera Kirpal. Everything was great right from the luxury suite I was given, to the efforts of the staff, till the discharge process. I am very impressed by the care I received here. I am forever grateful to the Apollo Cradle team. Mrs. Sukhdeep Kaur – Amritsar. I had my delivery in the Apollo cradle, Amritsar under the care of Dr Neera Kirpal. One cannot really rate a medical service or institution but if I could, I would give Apollo Cradle a 5-star rating. It is truly outstanding. Each and every aspect of medical care has been aced by the hardworking staff. Thanks, team Apollo Cradle! I would recommend them without hesitation to the new parents. I was recently admitted to the gynaecology and obstetrics department in the Apollo cradle. Dr Neera Kirpal and her team were effortless. The suite I was provided comprised of all the needed facilities, leaving no room for discomfort. The administration by the staff was incredible. I had a wonderful experience. Thank you very much for your help and support. Thank you, Apollo Cradle for being with us so that we could have an amazing birth experience under the care of Dr Neera. She was one of the biggest support during my stay. I had an overall positive experience. Though, I did feel a slight delay from the nursing staff at times. Apart from that, everything else was great. I felt both luck and great to have been put in contact with Apollo Cradle for my delivery. I would like to extend my gratitude to Dr Neera Kirpal and the entire team of Apollo Cradle for their tireless services and providing me with a memorable experience to go home with. Every aspect of my stay was tended to efficiently, thanks to the nurses, housekeeping and the administration. I felt cared for. I will forever be grateful to have my delivery done in the Apollo Cradle under the care of Dr Neera Kirpal. I had an excellent experience with them. Everything was just perfect. I feel comfortable and empowered from the start. The luxury room I was provided had all the facilities. Apollo Cradle is a life-saver. I was admitted in the gynaecology and obstetrics department of the Apollo Cradle. I received great hospitality here. The nursing staff, along with the doctors provided excellent care. The luxury suite I was provided was clean, hygienic and had quality services. I would like to give a special mention to Dr Neera for her efforts. She was my guide and cheerleader. My experience at Apollo Cradle under the care of Dr Neera was calm and beautiful rather than chaotic and frightening. The services were great. And the food provided was also of apt quality. However, I felt that the expenses were beyond what we can afford. So, we were forced to take discharge against medical advice for our baby. Please reduce rates for NICU. I was admitted in the Apollo Cradle for my delivery. Everything was excellent and I feel much more relaxed, educated and prepared. However, the true star of Apollo Cradle is Dr Neera Kirpal, who handled my case wonderfully. She is extremely knowledgeable and is passionate about what she is doing. Thanks a lot, Dr Neera! I knew that I wanted a special birth experience and Apollo Cradle surely gave me that. I was under the care of Dr Neera Khirpal. Her support helped me take control of my entire birthing experience. I would like to suggest that housekeeping can be improved. Apart from that, everything else was top notch. My baby was delivered at Apollo Cradle under Dr Neera’s supervision. The services provided by the hospital were excellent with super coordinating staff. The environment was hygienic and everybody was very kind. I would definitely recommend this hospital to my loved ones. The delivery of my child at Apollo Cradle under the care of Dr Neera was highly satisfying. The infrastructure is excellent and the staff is very compassionate. Doctors and nurses are skilled and polite. I am pleased with the environment and services provided to me. I would surely recommend Apollo to my dear ones. Apollo Cradle has its name for a reason. Dr Neera Kirpal is considerate and friendly. Hygiene is taken proper care of and the ambience is also pleasing. The nursing staff is so caring that family members can leave the patient alone. The food is also very tasty. I would surely recommend this hospital to my dear ones. My stay at the Apollo cradle, Amritsar was excellent in terms of everything from housekeeping to the treatment, assistance, comfort, food etc. that I received here. Dr Neera Kirpal and all the staff is extremely friendly and helpful. I feel blessed beyond measure to have received such impeccable treatment here. I had my delivery in the Apollo Cradle, Amritsar under the care of Dr Neera Kirpal. Childbirth is often a stressful time, but Dr Kirpal and her team made it extraordinary. I am very pleased with the services and my overall experience was a very positive one. Thank team Apollo, for your tireless services. We will surely recommend it to our loved ones. I visited Apollo Cradle for my delivery under the care of Dr Neera Kirapl. I had come to know about Apollo Cradle through the Internet and I would say that my experience was just as good as I had expected. The doctor is knowledgeable, kind, and thoughtful. All the staff took excellent care of me. They knew what they were doing. I was admitted to the Apollo Cradle for my delivery under the care of Dr Neera Kirpal. I am satisfied with my experience. I was tended to wonderfully by everyone, including the doctors and the nurses. Dr Neera is one of the kindest and supportive people I have ever met. Thanks to her and her team for my safe delivery. Mrs.Jag Deep Kaur – Amritsar. My experience at the Apollo Cradle, Amritsar was very satisfactory. One does not need to ask for anything, the staff gave us support every step of the way. Dr Neera Kirpal took great care of me and supported me fully by her knowledge. I am very grateful!! Thanks a lot for everything. I was treated in the Apollo Cradle under the care of Dr Neera Kirpal. My experience with Apollo Cradle was really good. I was sceptic and a little worried at first, but Dr Neera and the rest of the staff did an excellent job and made me feel at ease. I cannot fathom a better experience. I had my delivery in the Apollo Cradle under Dr Neera Kirpal. I would say that the services I received were excellent. The suite I was provided was very hygienic and comprised of all the required facilities. The nurses were attentive. I was truly satisfied with my experience and would recommend Apollo to everyone I can. Congratulations to you and your team. I had a pleasant experience at the Apollo Cradle under the care of Dr Neera. The cleanliness of the rooms, the food, the services, etc., everything was great. However, I had some problems on the last day of my stay here, which could have been handled better. I came to Apollo Cradle for the delivery of my child under Dr Neera Kirpal and I am highly satisfied with the hospital. The staff is respectful and empathetic towards the patient. Every need is catered to in a proper manner. The rooms are well equipped and infrastructure is worth the praise. I would surely recommend Apollo to others. I came to Apollo Cradle for the delivery of my baby under the care of Dr Neera. The hospital is very well equipped and doctors are highly skilled. The services are appreciable and the staff is exceptionally cooperative. I am thoroughly satisfied with the infrastructure and environment of the hospital. I am likely to recommend it to others. Apollo Cradle offers a home like experience and Dr Neera Kirpal is so kind and collaborative. Really liked the services and food. My experience here was superb and I am most likely to recommend it to others. The infrastructure of the Apollo Cradle is significant. I found the treatment given to patients to be great. The staff, Dr Neera, everyone was courteous and considerate. Although the staff sometimes delayed their services like feeding the baby. Otherwise, overall ambience and services provided by the hospital were exceptionally good. I will surely recommend Apollo to my dear ones. I came to Apollo Cradle for the delivery of my baby under the care of Dr Neera. I am so pleased and content with the hospitality of the staff. The hospital is well equipped and systemised. Staff and doctors are caring and polite. It was a homely experience. I am definitely recommending this hospital to my friends. I came to Apollo Cradle for the delivery of my first child under the care of Dr Neera and I am immensely satisfied with the hospital. The services provided were at par and the staff was super polite and considerate. The doctors are extremely skilled and the environment is hygienic and clean. I would surely recommend this hospital to my friends and family. I visited Apollo Cradle for the delivery of my child under Dr Neera who is an extremely skilled doctor. I am delighted with my experience at this hospital and would surely recommend it to my friends and family. Though the room provided to me was small, but it had all the amenities in it and the staff was very considerate and polite. I visited the Apollo Cradle for my treatment under the care of Dr Neera Kirpal and I am glad to say that I had a very pleasant experience here. The staff was helpful and cooperative and the doctors were professional and experienced. During the course of my treatment at the Apollo Cradle, I found all the services provided at the hospital to be very efficient and effective. Dr Neera is kind and helpful. I am very likely to recommend the hospital to my friends and family, owing to my great experience here. Apollo Cradle is without any doubt one of the best hospitals I have been to. What I really liked about the hospital was its staff. Everyone performs their duties in a well-regulated manner. Apart from their strong work ethics, everyone is also very cooperative and polite, especially Dr Neera Kirpal. I really liked the food too. I would surely recommend it to others.